In 2013, the American College of Cardiology (ACC) and the American Heart Association (AHA) released a new clinical practice guideline for the treatment of blood cholesterol in patients at high risk for atherosclerotic cardiovascular disease (ASCVD). The guideline was prepared by a panel of experts based on an analysis of the results of randomized controlled trials. The guidelines use the highest-quality scientific evidence to focus the treatment of blood cholesterol to those who are likely to benefit most. The panel recommended use of statins after a detailed review of other cholesterol-lowering drugs. “Most statins are generics and have been shown to provide the greatest benefit while having low rates of safety issues when taken as prescribed,” Dr. Stone says. The guidelines note, however, that there is a role for other cholesterol-lowering drugs in selected patients who suffer side effects from statins. The guidelines identified four major groups of patients for whom statins have the greatest likelihood of preventing stroke and heart attacks. Moderate- or high-intensity statin therapy is recommended for patients. 2. With primary elevations of LDL cholesterol of 190 mg/dL or higher. 3. Aged 40 to 75 with diabetes and LDL cholesterol levels between 70 and 189 mg/dL without clinical ASCVD. 4. Without clinical ASCVD or diabetes who are aged 40 to 75 with LDL-cholesterol levels between 70 and 189 mg/dL and have an estimated 10-year ASCVD risk of 7.5% or higher, but only after a clinician–patient discussion. The adoption of a heart-healthy lifestyle is critical to preventing and controlling high blood cholesterol, according to Dr. Stone. “The cornerstone of all guidelines dealing with cholesterol is a healthy lifestyle.” This is particularly important in younger patients who are at risk for high cholesterol later in life. 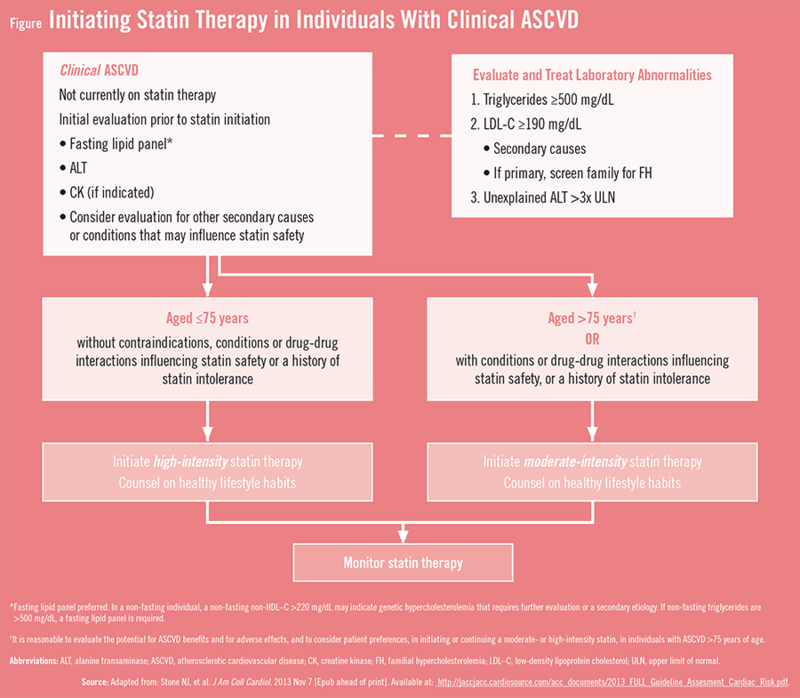 The guidelines note that for patients who already have ASCVD, lifestyle changes alone will not be enough to prevent heart attacks, stroke, and death, meaning that statin therapy will be necessary. Stone NJ, Robinson J, Lichtenstein AH, et al. 2013 ACC/AHA guideline on the treatment of blood cholesterol to reduce atherosclerotic cardiovascular risk in adults: a report of the American College of Cardiology/American Heart Association Task Force on Practice Guidelines. J Am Coll Cardiol. 2013 Nov 7 [Epub ahead of print]. Available at: http://content.onlinejacc.org/article.aspx?articleid=1770217. Taylor F, Huffman MD, Macedo AF et al. Statins for the primary prevention of cardiovascular disease. Cochrane Data System Rev. 2013;1:CD004816. Cholesterol Treatment Trialists Collaboration, Mihaylova B, Emberson J, et al. The effects of lowering LDL cholesterol with statin therapy in people at low risk of vascular disease: meta-analysis of individual data from 27 randomised trials. Lancet. 2012;380:581-590. Taylor F, Ward K, Moore TH et al. Statins for the primary prevention of cardiovascular disease. Cochrane Data System Rev (online). 2011:CD004816. Neil J. Stone, MD, has indicated to Physician’s Weekly that he has or has had no relevant financial interests to report within the past 5 years.